Great news in from our sponsor organization, Bristol Power CIC, which has just completed it’s first installation project. 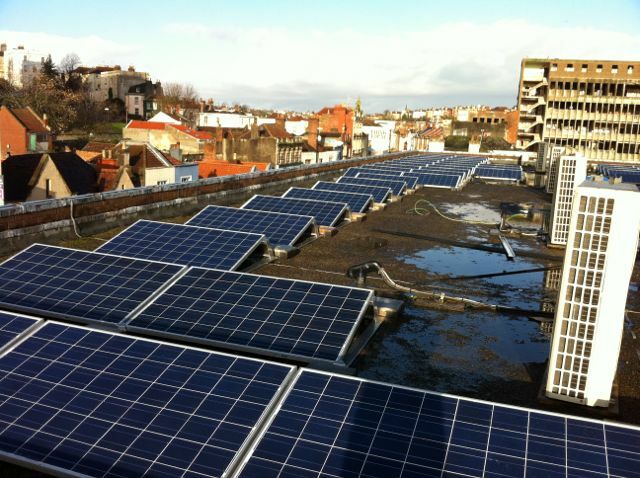 While this is not a Street-at-a-time project, BPC’s first arrays have broken ground for community energy in Bristol, by supplying free electricity to a mixed use community-run building. Power from these installed arrays feeds in to different users within the building: artists, social enterprises, and small businesses. Meanwhile, the economies of scale achieved will allow the project’s financing to be repaid with less than the income from Feed-in-Tariffs – with the excess being distributed as dividends between these electricity users! Importantly for the team, the project allowed them to learn the complexities of a large install, and improve their efficiencies for future projects. The next planned project is a whole street in a low income neighborhood of Bristol. Bristol Power intends to show that solar power is not just for the eco-aware middle classes, but that community renewable energy can tackle fuel poverty and benefit those who most need it. 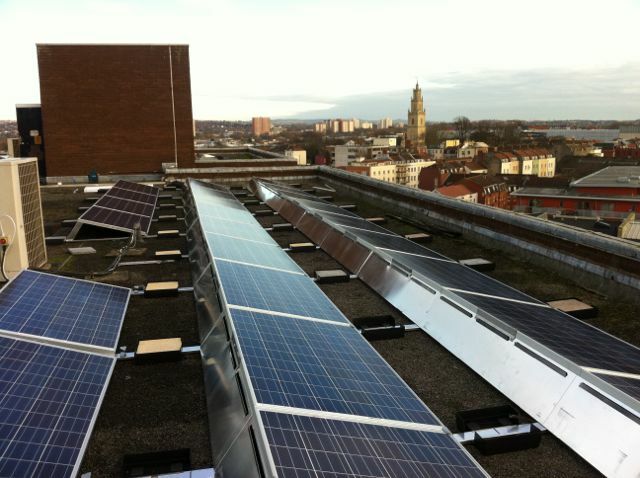 Ethical Solar, Bristol Power CIC (community interest company) and Bristol Energy Cooperative have come together to install a large 40kW solar PV system on a landmark community building. The system installed on the roof of Hamilton House, Stokes Croft and will generate a total of 37,880 kW/hrs of clean electricity each year. All partners will get paid for every unit of electricity it produces which will help to fund the great work of both Bristol Power and Bristol Energy Cooperative. Bristol Power promotes widespread community-owned renewable energy, through arranging finance and setting up small-scale coops to manage the installations and spend any surplus locally. Its next project is a feasibility study for solar panels on the roofs of an entire street in Bristol, in an area seriously affected by fuel poverty. For more information and to keep up to date, see their website: http://www.bristolpower.coop. Bristol Power had been planning to install all 40Kw of solar panels on Hamilton House in a nice phased progression, and had in principal secured ethical investment for the purpose. At the last minute, however, partly due to the suddenness of the government’s announced cutback in the Feed In Tariffs, they were only able to secure investment for 20kW worth of panels. Thankfully, Ethical Solar and Bristol Energy Cooperative stepped in to fill the gap and install the other 50%. Ethical Solar offered to install Bristol Energy Coop’s panels for free and have given the Cooperative six months to buy back the system. The coop will be raising the funds through a community share offer which will give people across Bristol the chance to become members of the Cooperative and own a stake in the project. Everyone had to act fast to take advantage of the higher feed-in tariff rates. The electricity produced will help keep down the bills for landlords Connolly and Callaghan, who have supported the project from the outset, and for the many artists, social enterprises and businesses who occupy Hamilton House as part of Coexist, who manage the building. The panels installed on the roof of Hamilton House are some of the most sustainable and cost effective available to the UK market. Each year the solar industry wastes tonnes of silicon cells due to abnormalities that often arise in production. Norwegian company Innotech take these cells and restore them to form high quality new modules. Not only does this innovation reduce the waste of the industry, it fundamentally reduces the cost of a typical solar system as well. Being manufactured in factories run on hydro power and by recycling the waste of the industry the solar system installed on the roof of Hamilton House will take just two years to generate the energy that was needed to produce them. That is some twelve years less than the industry standard conventional panels. The complete ‘recycled’ solar system will produce 37,880kW/hrs a year. With the higher tariff this will translate to an income of around £14,318 a year for 25 years. This will be paid for every unit of electricity it produces regardless of whether it is used or not. That’s a total earning of £357,950 over the system’s lifetime. What’s more Hamilton House can expect to make an annual saving on energy bills of £4,545. This money will enable continued investment in community energy projects. All parties are excited about the future of solar in this city with this project set to provide the backbone that community owned energy needs in Bristol.